Because NK cells lack gene-recombination machinery and are thought to be relatively short-lived, it is unclear whether NK cells can mount long-term effective recall responses to reinfections by diverse pathogens. In this article, we report that FcRγ-deficient NK cells, which we recently identified and termed g−NK cells, possess distinct memory features directed by FcR-mediated Ab-dependent target recognition. The presence of g−NK cells was associated with prior human CMV (HMCV) infection, yet g−NK cell responses were not restricted to HCMV-infected target cells. In the presence of virus-specific Abs, g−NK cells had greatly enhanced functional capabilities, superior to conventional NK cells, and were highly responsive to cells infected with either HCMV or HSV-1. Remarkably, the g−NK cell subset persisted long-term at nearly constant levels in healthy individuals. Therefore, FcRγ deficiency distinguishes an Ab-dependent memory-like NK cell subset with enhanced potential for broad antiviral responses. Natural killer cells are innate immune cells that contribute to host defense against viral infection and malignancy through rapid production of cytokines and the release of cytotoxic granules (1). In particular, NK cells play a crucial role in the control of herpesvirus infection, such as infection by human CMV (HCMV) (2–4). Despite being categorized as innate immune cells with a relatively short lifespan (estimated at 10–20 d) (5, 6), recent studies of mouse models demonstrate adaptive immune features of NK cells, such as recall responses to certain haptens and viral Ags lasting up to several months (7–9). However, considering the fact that NK cells lack mechanisms for gene rearrangement to generate Ag-specific receptors, the molecular basis for specific target recognition is poorly understood, and it is unclear whether NK cells can mount memory responses to diverse pathogens (1, 10). Recently, we found that about one third of healthy individuals have circulating FcRγ-deficient NK (g−NK) cells that express CD3ζ normally but are deficient for FcRγ (11), the two signaling adaptors associated with the FcR CD16 (12). In the current study, we provide evidence that g−NK cells represent a distinct type of memory cell that primarily uses pathogen-specific Abs instead of Ag-specific receptors for target recognition. PBMCs from healthy donors were obtained with informed consent or from discarded, deidentified leukoreduction filters (American Red Cross), as approved by the Michigan State University Biomedical and Health Institutional Review Board. PBMCs were stained using Abs for flow cytometry, and CD56dimCD3−CD14−CD19− cells were gated as previously described (11). Briefly, cells were stained with Abs for cell surface markers and then fixed in 2% formaldehyde. To distinguish g−NK cells, samples were treated with permeabilization buffer containing 0.1% saponin, followed by staining of intracellular proteins, including FcRγ (anti-FcεRI, γ subunit; Millipore) and CD3ζ (clone 6B10.2; eBioscience). MRC-5 lung fibroblasts or human foreskin fibroblasts were cultured in 96-well plates, infected (multiplicity of infection = 1) with HCMV (Towne strain; or AD169) or HSV-1 for 2 h, and then washed with PBS to remove unadsorbed virus. PBMCs were cultured for 1–5 d with HCMV-infected cells or for 40 h with HSV-1–infected cells in the presence of recombinant human IL-2 (10 U/ml). Six hours prior to analysis, 1 μl plasma or purified IgG (Nab Protein A Plus Purification Kit; Thermo Scientific) was added along with brefeldin A (for cytokine analysis) or anti-CD107a with monensin (for degranulation). To exclude dead cells, a LIVE/DEAD Cell Stain Kit (Invitrogen) was used. Serological status of donor plasma was determined using ELISA kits (MP Biomedicals), according to the manufacturer’s instructions. The Wilcoxon matched pairs signed rank test was used for all assays with the exception of ELISAs, for which the χ2 test was used. Differences were considered significant when p < 0.05 (GraphPad Prism). To explore the origin of g−NK cells, we compared the phenotypic characteristics of conventional NK cells, which express FcRγ, and g−NK cells from healthy donors. Analysis of killer cell Ig-like receptors, which are expressed by subsets of NK cells (13), showed that, in many donors, g−NK cells predominantly expressed particular killer cell Ig-like receptors (Supplemental Fig. 1), suggesting that the g−NK cell subset is an outcome of expansion. Considering the expansion and presence of g−NK cells in about one third of healthy donors (11), we hypothesized that the presence of g−NK cells might be associated with prior infection by a common pathogen that does not cause illness in the presence of normal immune function. Previously, we found that, compared with conventional NK cells, g−NK cells display markedly lower levels of NKp30 and NKp46 (11), the natural cytotoxicity receptors associated with FcRγ (14). Interestingly, a subset of NK cells with a similar NCRlo phenotype was found in HCMV-seropositive, but not in HCMV-seronegative, individuals (15). To examine the possible association of g−NK cells with HCMV, we tested for HCMV-specific Abs in the plasma of 42 healthy donors, 17 of whom had g−NK cells. HCMV seropositivity correlated strongly with the presence of g−NK cells (p < 0.0001); all donors with g−NK cells, except for one, were seropositive for HCMV IgG (Fig. 1A). In contrast, seropositivity for HSV-1 or HSV-2, two common herpesviruses, did not correlate with the presence of g−NK cells. Among the donors with g−NK cells, only two were weakly positive for HCMV IgM (data not shown), suggesting that most of these seropositive donors did not have a recent HCMV infection. Analysis of the one HCMV-seronegative donor with g−NK cells revealed a substantial number of memory T cells specific for the immunogenic HCMV tegument protein pp65 (data not shown) (16), indicating that this donor had also been exposed to HCMV. Thus, the presence of g−NK cells is strongly associated with previous exposure to HCMV. Association of g−NK cells with prior HCMV infection. (A) Frequencies of g−NK cells among the CD56dimCD3−CD14−CD19− population within individual donors grouped according to IgG serological status for HCMV, HSV-1, or HSV-2 (n = 42). (B) Comparison of marker expression on conventional NK (○) and g−NK (●) cells within CD56dimCD3−CD14−CD19− population. Graphs show percentage of cells expressing indicated markers. *p < 0.01, **p < 0.0001. ns, Not significant. Unlike conventional NK cells, g−NK cells showed predominant expression of NKG2C in many, but not all, donors (Fig. 1B). Notably, previous studies showed that HCMV-seropositive donors tend to have elevated numbers of NKG2C+ NK cells, which express high levels of CD57 and infrequent NKG2A (15–17). In line with this, g−NK cells also expressed high CD57 and low NKG2A levels, regardless of NKG2C expression. Given the association with HCMV infection, we next sought to determine whether g−NK cells respond better than conventional NK cells to HCMV-infected cells. NK cell responsiveness was evaluated by examining intracellular IFN-γ after incubation of PBMCs with lung fibroblasts (MRC-5) that were either mock infected or infected with the Towne strain of HCMV (18). Although the overall production of IFN-γ by NK cells was slightly increased over background, g−NK cells produced less IFN-γ than conventional NK cells (Fig. 2A). The lower responsiveness of g−NK cells was also observed with a different strain of HCMV (AD169), as well as with different host cells (Supplemental Fig. 2A). These data indicate that g−NK cells do not respond well to direct stimulation by HCMV-infected target cells. g−NK cells display enhanced effector functions in response to HCMV-infected cells in the presence of HCMV-specific Abs. PBMCs were cultured with mock- or HCMV-infected MRC-5 cells as indicated. (A and B) Flow cytometric analysis of IFN-γ production by conventional NK and g−NK cells from a representative donor following 3 d of incubation. Numbers represent the relative percentage of IFN-γ+ NK cells (left panels). Line graphs show the percentages of conventional NK (○) or g−NK (●) cells that produced IFN-γ from several donors in the absence (A) or presence (B) of autologous plasma or purified IgG (Ab) as indicated. Circles connected by a line designate the same donor sample. (C) Production of TNF-α by conventional NK or g−NK cells in the presence or absence of autologous plasma or purified IgG from several donors. (D) Expression of CD107a in the presence or absence of autologous plasma or purified IgG following 2 d of incubation. *p < 0.05, **p < 0.01. Because we previously found that g−NK cells responded robustly to stimulation through mAb-mediated cross-linking of CD16 (11), we examined whether the presence of naturally occurring Abs against HCMV would impact g−NK cell responses. Using flow cytometry, we first confirmed the presence, albeit at different concentrations, of Abs that bound to HCMV-infected cells in the plasma of seropositive donors (data not shown). Addition of autologous plasma led to the dramatic production of IFN-γ by g−NK cells at levels significantly (p < 0.01) higher than by conventional NK cells (Fig. 2B). Although there was notable variation, presumably reflecting variations in Ab concentrations and subclasses between donors, the g−NK cells responded more robustly than did conventional NK cells from all donors tested. The enhancing effects of plasma were dependent on the presence of infected cells, because plasma with mock-infected cells did not induce such responses. Addition of Abs purified from autologous plasma also led to similarly high production of IFN-γ by g−NK cells (Fig. 2B). These data indicate that plasma from all seropositive donors tested contained Abs specific for viral Ags expressed on the surface of infected cells that triggered cytokine production through CD16. The higher responses of g−NK cells were also observed with the AD169 strain, as well as with different host cells in the presence of plasma (Supplemental Fig. 2B, 2C). This robust responsiveness of g−NK cells was observed consistently over a wide range of plasma concentrations and at different time points (data not shown). Furthermore, g−NK cells produced significantly (p < 0.01) higher levels of TNF-α compared with conventional NK cells in the presence of plasma or purified Ab (Fig. 2C; Supplemental Fig. 2B, 2C). To assess the cytolytic potential of NK cells, we examined the expression of CD107a, a degranulation marker, following incubation with HCMV-infected target cells. In the absence of Ab, the degranulation response of g−NK cells was significantly (p < 0.01) lower than conventional NK cells (Fig. 2D). Compatible with our data, NKG2C+ NK cells in HCMV-seropositive donors were previously shown to respond poorly to HCMV-infected cells (19, 20). In contrast, in the presence of plasma or purified Ab, g−NK cells showed higher levels of CD107a (p < 0.05) compared with conventional NK cells (Fig. 2D). Therefore, direct recognition is unlikely to be the primary mechanism for g−NK cell reactivity against HCMV-infected cells, and the enhanced cytokine and degranulation responses of g−NK cells to HCMV-infected targets are Ab dependent. Taken together, the association with prior HCMV infection and enhanced Ab-dependent functional responsiveness of g−NK cells reveal distinct adaptive immune features that may lead to enhanced recall responses during reactivation or reinfection by HCMV. Given the augmented responsiveness in the presence of HCMV-specific Abs, we reasoned that g−NK cells could also respond robustly to other pathogens when pathogen-specific Abs are available. To test this possibility, PBMCs from HSV-1–seropositive donors were cocultured with HSV-1–infected cells in the presence or absence of autologous plasma. Similar to the HCMV-infection setting, IFN-γ production by g−NK cells was significantly higher (p < 0.05) than from conventional NK cells in the presence of seropositive plasma (Fig. 3A, 3B). This plasma effect was Ab specific, because the addition of autologous plasma lacking HSV-1–specific Abs did not elicit such responses from HSV-1–naive g−NK cells (Fig. 3B). These data indicate that the plasma from HSV-1–seropositive donors contained Abs specific for HSV-1–derived Ag(s) on infected cells, and g−NK cells respond to HSV-1–infected target cells more robustly than do conventional NK cells in an HSV-1–specific Ab-dependent manner. Enhanced effector responses of g−NK cells to HSV-1–infected target cells in the presence of virus-specific Abs. (A) Dot plots from one representative sample depict relative percentages of IFN-γ+ conventional NK and g−NK cells in the presence of autologous plasma after culture with HSV-1–infected MRC-5 cells. (B) Relative frequencies of IFN-γ+ conventional NK (○) and g−NK (●) cells from anti-HSV-1+ (n = 6) or anti-HSV-1− donors (n = 4) cultured with HSV-1–infected MRC-5 cells in the presence or absence of autologous plasma. Circles connected by a line designate the same donor sample. (C) IFN-γ production by g−NK and conventional NK cells from a representative HSV-1–seronegative donor in the presence of purified allogenic IgG following coculture with HSV-1– or HCMV-infected target cells. The antiviral specificities of the plasma sources for purified IgG are indicated. All cocultures were performed for 40 h. *p < 0.05. To examine whether g−NK cells from HSV-1–naive donors could respond to HSV-1–infected cells, Abs were purified from nonautologous plasma and tested for the ability to enhance cytokine production. The addition of Abs purified from HSV-1–seropositive donors led to greatly enhanced IFN-γ production by g−NK cells over conventional NK cells from HSV-1–naive donors cocultured with HSV-1–infected cells (Fig. 3C). In contrast, Abs lacking HSV-1 reactivity did not yield such responses. In parallel experiments, the addition of nonautologous HCMV-specific Abs led to enhanced responses from g−NK cells cultured on HCMV-infected cells as expected. These data indicate that g−NK cells, regardless of prior exposure, can mount more potent functional responses to virus-infected cells than can conventional NK cells if virus-specific Abs are provided. Thus, g−NK cells have enhanced potential to mediate Ab-dependent cross-protection against a broad spectrum of viral infections. We next sought to determine whether g−NK cells are a transient or stable population. Longitudinal studies showed that the relative frequencies of g−NK cells within the NK cell pool, as well as their absolute numbers, were nearly constant for 4–9 mo after original assessments (Fig. 4A, 4B). The subset composition of g−NK cells was also stable, and there was no discernible change in functional responsiveness at these time points (data not shown). For donors that initially had no detectable g−NK cells (n = 7), there was no appearance of g−NK cells during this period (data not shown). With respect to abundance, certain donors maintained large numbers of g−NK cells, in some cases exceeding the number of recirculating memory CD8+CD45RO+ T cells (Fig. 4B). These results indicate that the size of the g−NK cell pool is maintained long-term with no indication of decline, an important feature of memory-type cells. Because the antiapoptotic protein Bcl-2 is important for NK cell survival (5, 21) and is also elevated in memory CD8+ T cells (22), we analyzed expression of this protein. In all donors (n = 11), g−NK cells expressed significantly higher levels (p < 0.01) of Bcl-2 than did conventional NK cells (Fig. 4C). Analysis of the activation marker CD38, together with our previous data showing no detectable expression of activation markers CD69 and CD25, indicated that g−NK cells were not in an activated state (Fig. 4D). Finally, we analyzed several markers that have been associated with memory T cells (23). Although g−NK cells did not express CD45RO, CCR7, or CD127, the levels of CD44, CD11a, and CCR5 were higher on g−NK cells compared with conventional NK cells (Fig. 4D, data not shown), reminiscent of the differences between naive and memory T cells (23). Together, g−NK cells appear to be long-lived quiescent memory-type cells. g−NK cells persist long-term at nearly constant levels. (A) Percentages of g−NK cells among total NK cells collected at the initial time point and 4, 5, or 9 mo later from healthy donors (n = 9). (B) Absolute number of indicated subsets among 1 × 106 lymphocytes collected at the initial time point (T1) and 4 or 5 mo later (T2). Data are mean ± SEM (n = 7). (C) Expression analysis of Bcl-2 in conventional NK and g−NK cells from one representative donor. Shaded graph represents control staining (left panel). Mean fluorescence intensity of Bcl-2 expression (n = 11) in conventional NK (○) and g−NK (●) cells (right panel). Circles connected by a line indicate the same donor sample. (D) Marker expression (mean fluorescence intensity) on conventional NK and g−NK cells. *p < 0.01, **p < 0.001. Collectively, our study reveals memory features of g−NK cells distinct from other memory cells. Unlike classical memory cells that use gene-rearranged Ag-specific receptors, g−NK cells use the germline-encoded FcR that recognizes Abs bound to target cells. 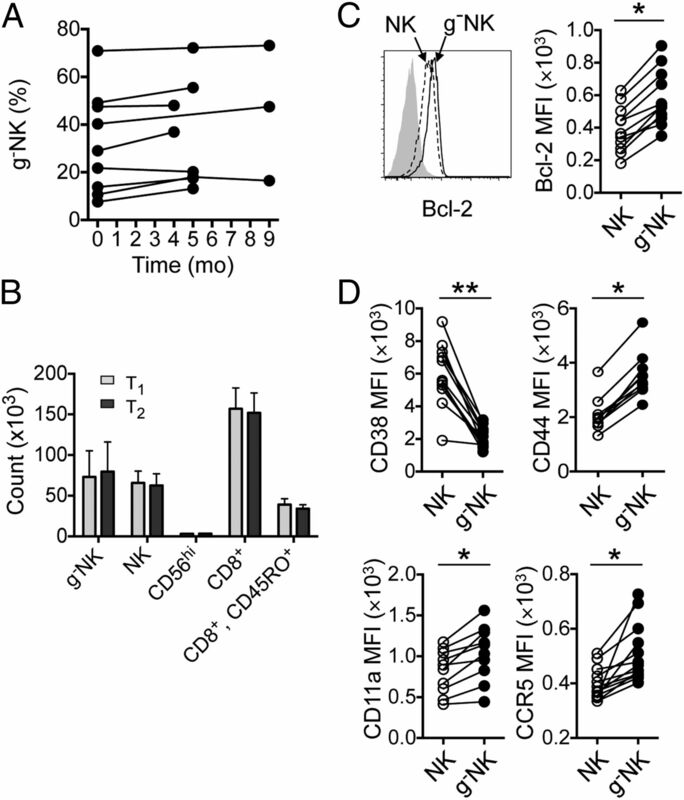 Moreover, g−NK cells are unlikely related to Ag-specific memory NK cells described in mouse models (7–9), because FcRγ deficiency abrogates CD16 expression on murine NK cells (24), and these memory-type NK cells disappear with a constant rate of decay (25). Importantly, the responses of g−NK cells are not restricted to a specific pathogen, because Ag specificity is conferred through Ag-specific Abs. Given the persistence and enhanced capabilities, g−NK cells are poised to impact the host immune response to diverse pathogens over the long-term, particularly during later stages of primary infection, reinfection, or chronic infection if pathogen-specific Abs are available. Thus, g−NK cells may represent a new class of memory cells that does not depend on Ag-specific receptors, for which FcRγ deficiency itself provides a molecular signature. Finally, g−NK cells may have important implications for Ab-based therapies for infectious diseases and cancer in which the enhanced responsiveness of g−NK cells to Ab-bound targets could significantly impact therapeutic efficacy. We thank J. Drach and J. Breitenbach (University of Michigan, Ann Arbor, MI) for virus stocks and host cells, P. Wallace for phlebotomy services, B. Siegfried and the American Red Cross for leukoreduction filters, A. Kim and T. Kakarla for technical support, K. Meek for critical reading of the manuscript, and W. Esselman for discussion and advice. This work was supported by the National Cancer Institute, National Institutes of Health (5R21CA149476), Michigan State University, and a National Agenda Project grant from the Korea Research Council of Fundamental Science and Technology, Republic of Korea (all to S.K.).
. 2011. Innate or adaptive immunity? The example of natural killer cells. Science 331: 44–49.
. 1989. Severe herpesvirus infections in an adolescent without natural killer cells. N. Engl. J. Med. 320: 1731–1735.
. 2005. Fatal varicella associated with selective natural killer cell deficiency. J. Pediatr. 146: 423–425.
. 2008. Human NK cells can control CMV infection in the absence of T cells. Blood 112: 914–915.
. 2003. IL-15 is an essential mediator of peripheral NK-cell homeostasis. Blood 101: 4887–4893.
. 2004. Turnover and proliferation of NK cells in steady state and lymphopenic conditions. J. Immunol. 172: 864–870.
. 2006. T cell- and B cell-independent adaptive immunity mediated by natural killer cells. Nat. Immunol. 7: 507–516.
. 2009. Adaptive immune features of natural killer cells. Nature 457: 557–561.
. 2010. Critical role for the chemokine receptor CXCR6 in NK cell-mediated antigen-specific memory of haptens and viruses. Nat. Immunol. 11: 1127–1135.
. 2010. Memory-like responses of natural killer cells. Immunol. Rev. 235: 297–305.
. 2012. Identification of human NK cells that are deficient for signaling adaptor FcRγ and specialized for antibody-dependent immune functions. Int. Immunol. 24: 793–802. 2005. MHC class I molecules and KIRs in human history, health and survival. Nat. Rev. Immunol. 5: 201–214.
. 2006. Surface NK receptors and their ligands on tumor cells. Semin. Immunol. 18: 151–158.
. 2004. Imprint of human cytomegalovirus infection on the NK cell receptor repertoire. Blood 104: 3664–3671.
. 2011. Expansion of a unique CD57⁺NKG2Chi natural killer cell subset during acute human cytomegalovirus infection. Proc. Natl. Acad. Sci. USA 108: 14725–14732.
. 2012. CMV drives clonal expansion of NKG2C+ NK cells expressing self-specific KIRs in chronic hepatitis patients. Eur. J. Immunol. 42: 447–457.
. 1996. Human cytomegalovirus clinical isolates carry at least 19 genes not found in laboratory strains. J. Virol. 70: 78–83.
. 2011. NKp46 and DNAM-1 NK-cell receptors drive the response to human cytomegalovirus-infected myeloid dendritic cells overcoming viral immune evasion strategies. Blood 117: 848–856.
. 2010. Short-term exposure to human cytomegalovirus-infected fibroblasts induces a proportional increase of active CD94/NKG2A(+) natural killer cells. Hum. Immunol. 71: 29–35.
. 2002. In vivo evidence for a dependence on interleukin 15 for survival of natural killer cells. Blood 100: 3633–3638.
. 1994. FcR gamma chain deletion results in pleiotrophic effector cell defects. Cell 76: 519–529.
. 2011. Comparing the kinetics of NK cells, CD4, and CD8 T cells in murine cytomegalovirus infection. J. Immunol. 187: 1385–1392.